With the capture of Eric's Common from Rainbow Lake in France at 91lb, the former world record common carp is now officially broken. The record breaking angler is the person the fish was named after years ago, Eric Smith. 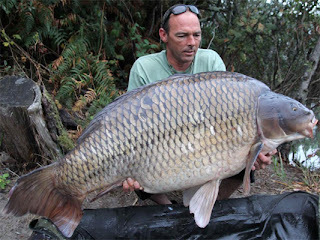 Many carp anglers already expected the common carp 'Eric's Common', named after Eric Smith, to break Markus Pelzer's world record of 40,2 kg (89+lb). 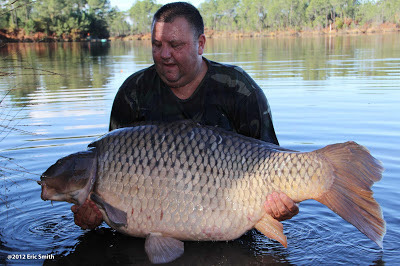 Last weekend Eric Smith captured the same carp named after him at a new world record weight of 91lb. The huge common was captured several times the last couple of months, for the last time on October 25th by Paul Hudson (see picture below). Unfortunately there haven't been any pictures released yet of Eric with his common world record. Earlier this year the same fish was landed tangled up in the line of a carp fisherman at 91lb 4oz, but this record was never claimed since it was captured by accident.